Damien Hirst, the artist who once represented the avant-garde in Britain, is turning his attention to the next wave of talent, commissioning new works and even providing studio space for the younger artists who feature in his latest exhibition at Newport Street Gallery in south London. It is a move that will likely earn Hirst comparison with Charles Saatchi, the collector and advertising tycoon who bought many of the artist’s early works, showing them in his Boundary Road gallery in north London, an early prototype for Hirst’s exhibition space. For the new show, titled True Colours, which opens to the public today, 6 June (until 9 September), Boo Saville, Helen Beard and Sadie Laska have between them produced 21 new paintings, which are hung alongside around 30 older pieces. All have been bought for undisclosed sums for Hirst’s Murderme collection. Saville, who lives and works in Margate, has been working in Hirst’s studio in Gloucester, while Brighton-based Beard was given a space in Hirst’s Peckham studio. “Damien has been an amazingly kind mentor. As soon as I told him I could not physically fit the canvases through the door of my studio in Brighton, he offered his studio free of charge,” Beard says. 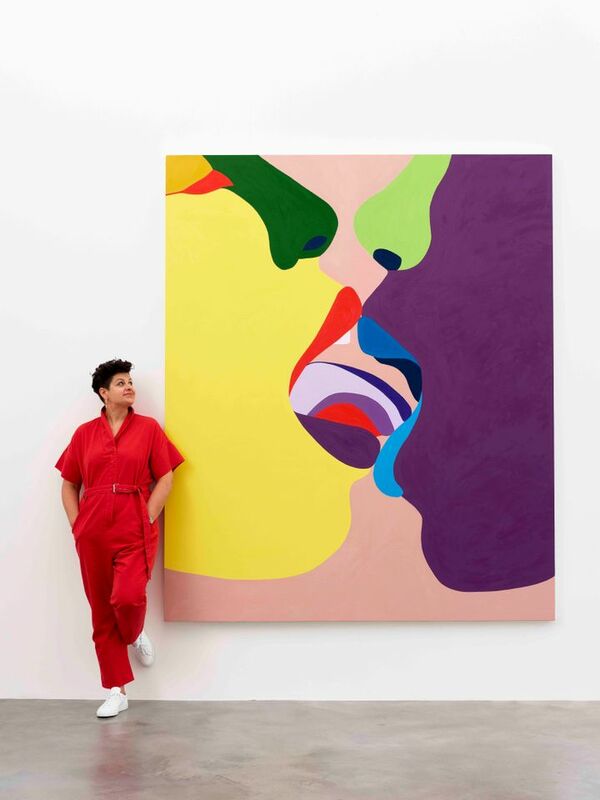 Beard has created her largest work to date for the show, a three-metre-high mirror image of a copulating couple rendered in vivid blocks of colour. “Damien definitely has encouraged me to think bigger than ever before,” she says. Hirst also enabled Saville to produce her largest ever colour field painting. “I’ve wanted to work bigger for ages but there are challenges with working at that scale,” she says. “Lots of those challenges are practical ones and you need a certain level of infrastructure to make it possible.” Saville creates her colour field canvases by applying up to 30 layers of paint and then sanding them back to achieve a flawless, shimmering surface. These are interspersed in the gallery with Saville's black-and-white figurative paintings based on random images sourced from the internet: a cat born with two faces, a man surveying his erection, a paper flower. Laska, who lives and works in New York, says the city’s studio spaces can limit artists. “There was a dialogue [with Damien] about size and scale,” she says. “He has an ambition when it comes to art making that is difficult for younger artists.” For the exhibition, she has made around seven new pieces that combine materials such as recycled canvases, spray paint, foil and IKEA bags. It is not the first time Hirst has commissioned works for exhibitions at Newport Street Gallery; Dan Colen and Rachel Howard have previously created new pieces. But the focus has certainly shifted to supporting emerging talent. Beard, who is not currently represented by a gallery, says Hirst’s commissions are already attracting attention from other collectors. “Whether it is an alternative model to the gallery route I don’t know, but it is brilliant to be part of his collection and I think he is an amazing patron,” she says. Saville, who shows with the London gallery TJ Boulting, describes it as more of a collaborative relationship. “As Damien is an artist, it allows him to see through my eyes a bit more and understand the needs I might have or situations an artist might face,” she says.